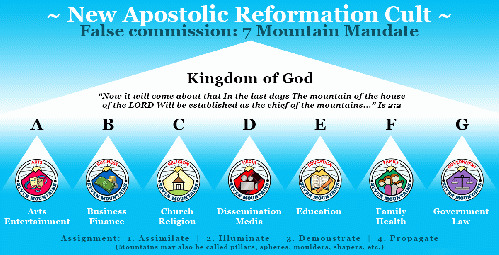 Joseph Mattera is now vying for the leadership of the New Apostolic Reformation (NAR). As such he keeps putting out NAR propaganda pieces where he keeps trying to convince people that taking over the world and conquering seven mountains is what Jesus wants from his followers. The idol worship of America is one of the fastest growing heresies today and will lead to the one world religion. Beloved the reality is that America has been the best pagan nation in history but that does not change its paganism. Its Founding Fathers did not seek out to establish a religious country. The majority of these men were deists, which means they believed "a" god, but necessarily THE God, Thomas Jefferson rewrote the bible to remove all references to the deity of Jesus Christ! The link above is yet another attempt by Mattera to justify the heretical beliefs of the NAR. Let us reason together once again. Mattera's opening premise is biblically absurd. He was fine right up to the point that he pretended the bible says anything about reframing realms of society at the resurrection because of the lordship of Jesus Christ. It sounds pious. It sounds like it could be biblical if you never read the bible. I always liken this line of thinking to the shortsightedness of those that followed Jesus when He walked the earth. The NAR preachers and dominionists all like to play the victim. They decry the sinful world they live in but keep trying to revive it. In the days of Jesus the Jews were real victims of oppression from Rome. Jesus came to deliver than however from something far more important and oppressive -- their sins. It is the same mission the Gospel still carries out to this very day yet those that fancy themselves Christian are still more concerned about being delivered from Rome. Consider the key verses from the story of the Road to Emmaus. Jesus comes alongside followers of his walking to Emmaus. He asks them what they are talking about and the recount the sad ending at Calvary just three days earlier. After three years of the ministry of Jesus and the promises of deliverance from sin what is it that they are saddest about? That He did not deliver them from Roman oppression. Those that claim to know Christ today are equally sad about their plight in this carnal world when they hold the keys to the kingdom of heaven in the Gospel. Here is today's sad and deep theology. They do not want the kingdom of heaven. Do not be deceived beloved. When someone says that "realms of society have been reframed" you are about to go seven mountain climbing down the road to Emmaus. At least Mattera did not try to bury the lead and pretend that politics is not the most obsessed over of the seven mountains. The challenge that Mattera and NAR adherents always face is their theology is so unbiblical it is simply impossible to support scripturally. The story in Acts 17 is of the Jews stirring up trouble against Paul by spreading disinformation. They used the worship of Caesar to further their point but the reality is that Gospel is apolitical. It is apathetic towards the politics of man. The Gospel does not seek to supplant earthly politics. It is above them. The kingdom of Christ is not of this earth, remember? Those men turned the world upside down because of and through the Gospel.